Usually if I have a giveaway, I just have an update on top of the blog with the winner’s first name and notice that the giveaway is closed. 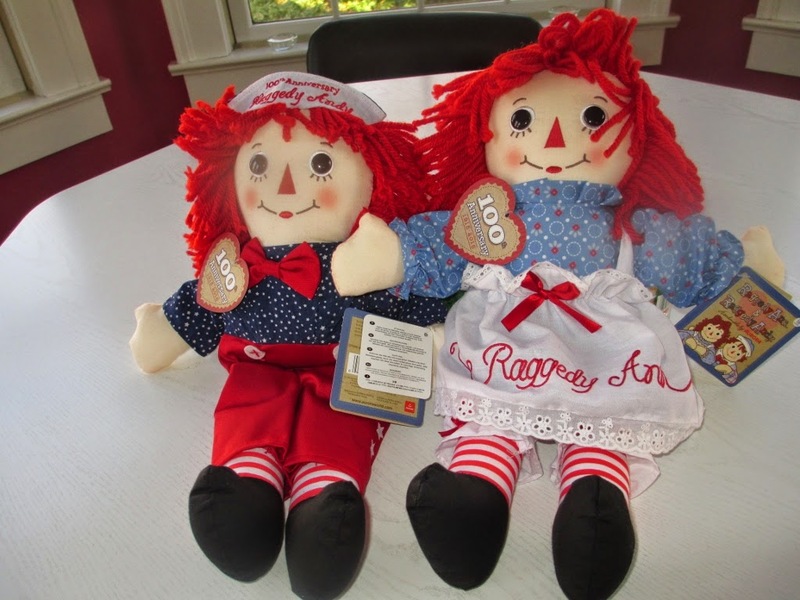 However, the responses to the 3 Raggedy Ann and Andy 100th Anniversary Doll giveaway garnered so many personal stories and stories of lifetime interest in Raggedy Ann that I just had to write another article about the winner and the blog comments about this giveaway. 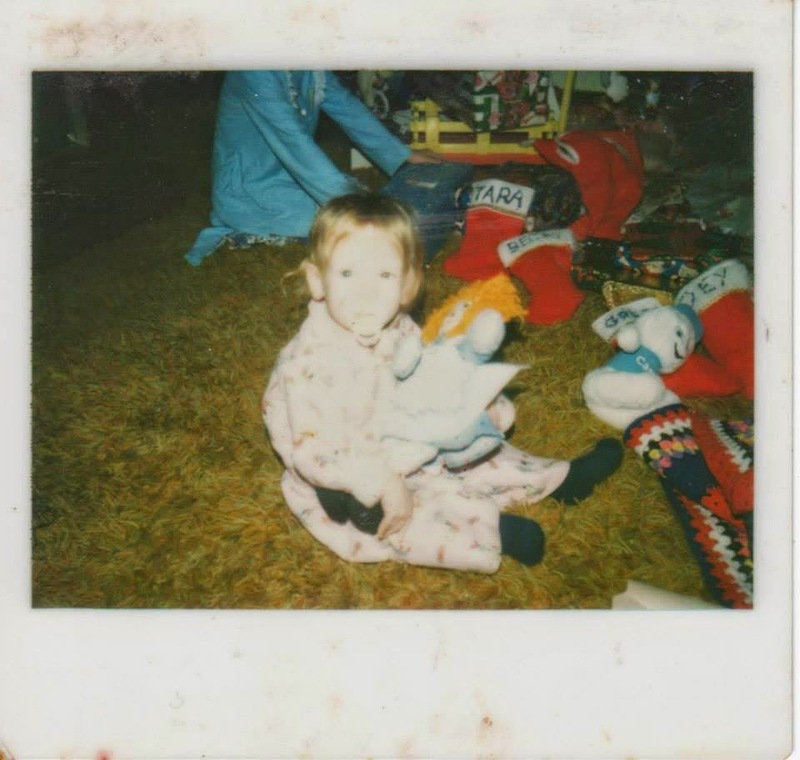 Here is Greta with her first Raggedy Ann doll - Isn't she cute? I wonder if Greta and her daughter will be bringing any new Raggedy Anns with them? I had no idea - This is just remarkable. I am so delighted that Greta won the dolls. Greta blogs about her family at gretasmonoblog.blogspot.com and she has lots to share as the mother of 4. Kathy Ellis left a comment on my facebook page announcing this year's Raggedy Ann Rally with a huge celebration for her 100th anniversary. Learn more here. And if you go, please post pictures here and on my facebook page for all to enjoy. To tell the truth – I have never felt this way with ANY giveaway – but I wish I had a hundred to give away – I know that all would have found wonderful homes with everyone who left a comment. This post brought back many happy memories described by commenters. They also had handmade dolls, Raggedy Ann bedspreads, and Halloween costumes. Some posters still have their dolls and would like to be able to give one to a daughter or granddaughter. Thanks to everyone who commented on the Raggedy Ann giveaway post. I hope it made you smile and remind you of your own experience. Even if you didn’t win you can still buy an anniversary doll or treasury of stories book. See the links below. 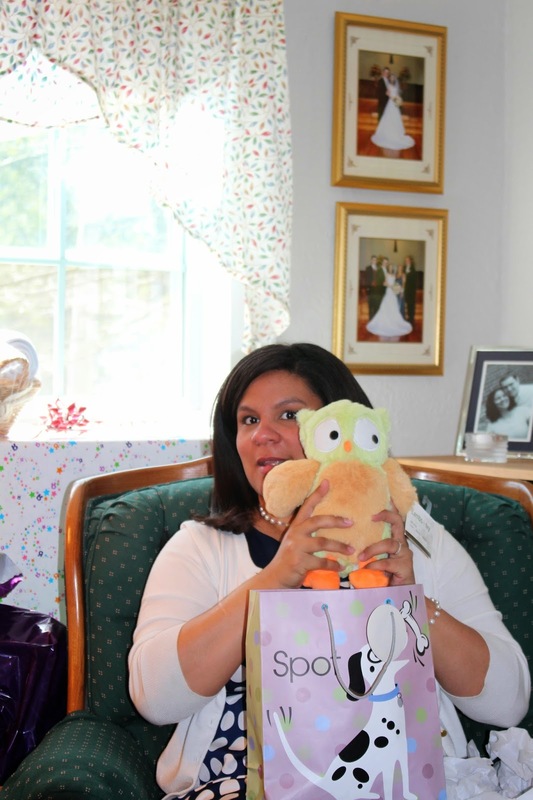 Last week we hosted the baby shower for my daughter-in-law at our house. 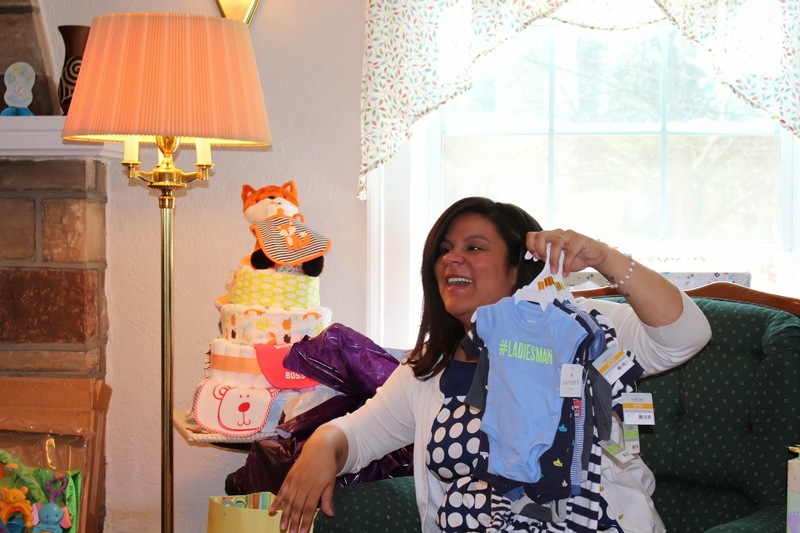 I thought I’d share a few highlights – and maybe give you some ideas – in case hosting a baby shower is in your future. I prefer to have events like showers at home rather than in a hall or restaurant. But I must be honest it is a lot of preparation work. Anyway this post is all about the celebration and fun parts. 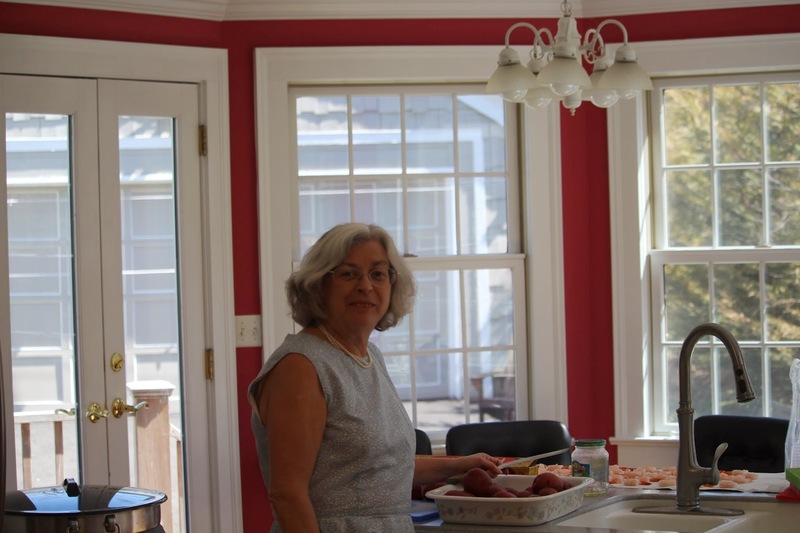 Before people arrived a bunch of us were cooking and decorating….. 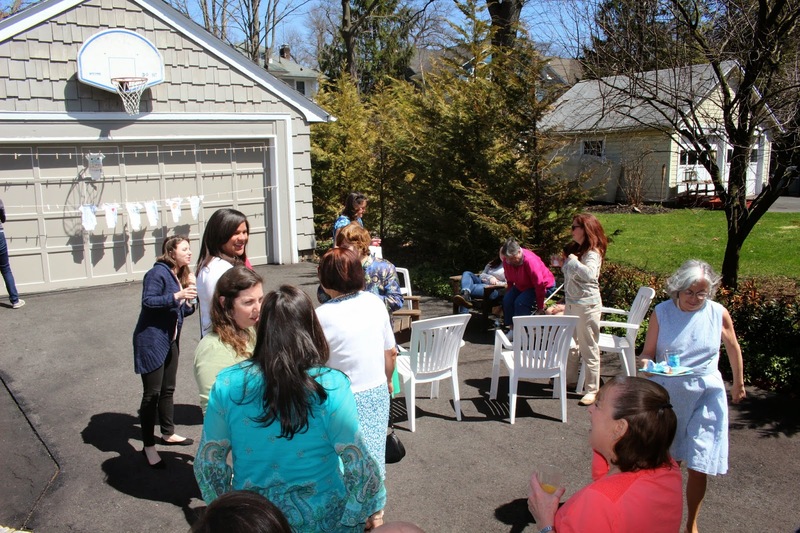 Although we were set up for an inside party, the weather was so beautiful that half of it spontaneously moved outside. 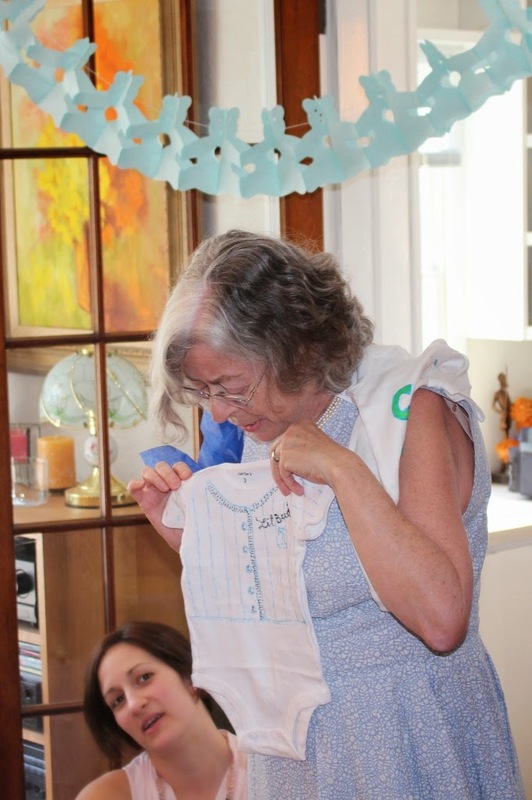 One of my favorite activities for a baby shower is to have guests decorate onesies with fabric markers. And this was one creative crowd. 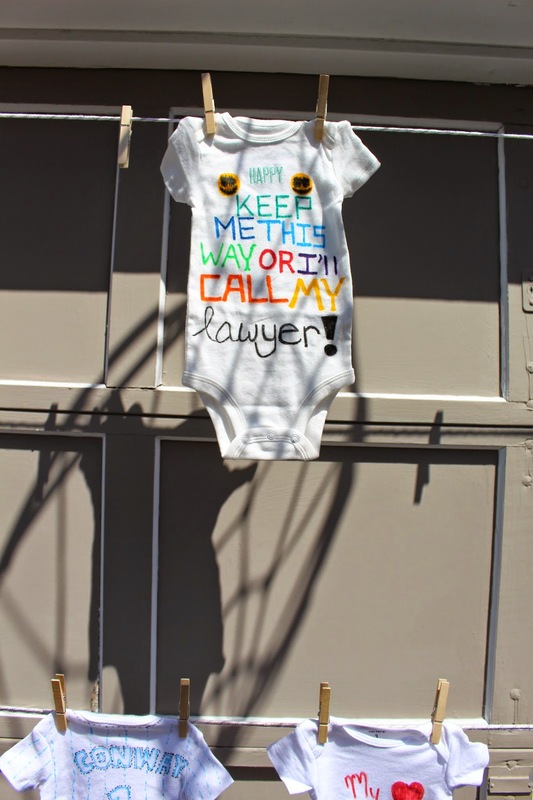 The onesies were decorated at a table in the family room and then hung on a line in front of the garage. 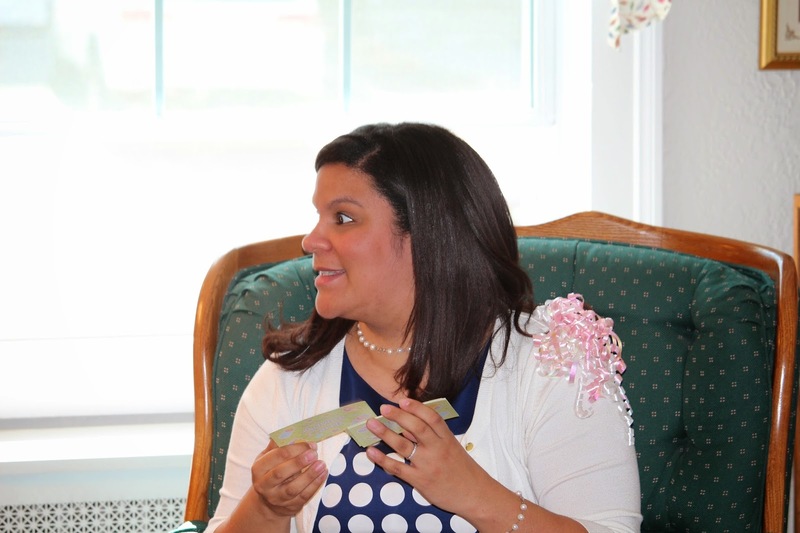 Moms and Grandmas also enjoyed filling out “Advice Cards” for the soon to be Mom. These activities all were started as soon as people arrived –right after getting a Mimosa or glass of punch and were well underway before the guest of honor arrived. After a buffet lunch we gathered in our living room to watch Isabel open gifts. 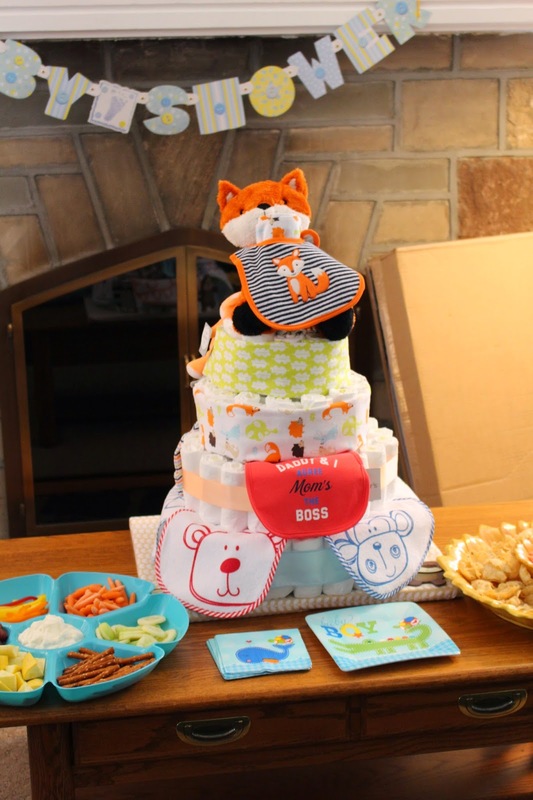 Here is one gift that didn’t get unwrapped it is a diaper cake (It has over 100 diapers!) that my niece made. 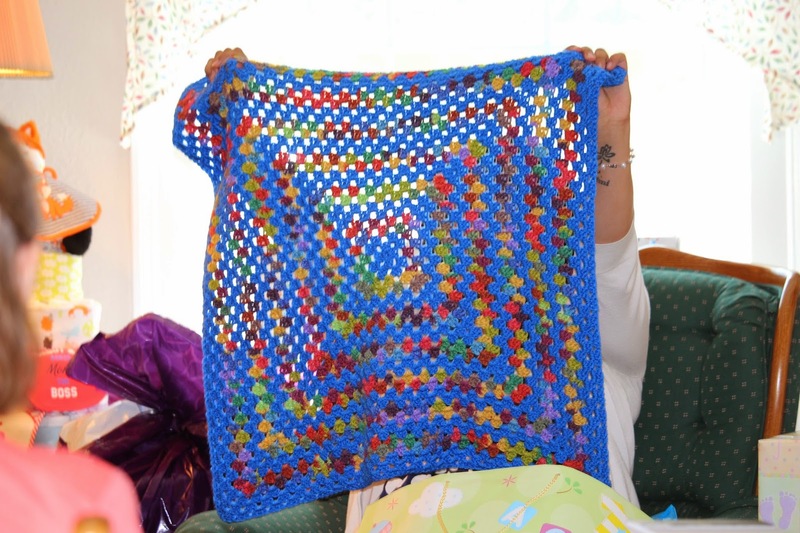 You can’t have a baby shower without getting at least one hand knitted blanket. 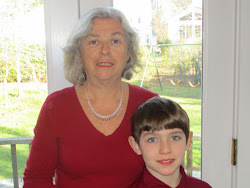 Cousin Bea made this one – Isn’t it beautiful? Then Isabel read the advice cards. The very first one said – “Don’t listen to anyone’s advice.” After huge laughter, she read the rest of the advice. There is serious advice, advice to enjoy every moment and young mother truth advice. 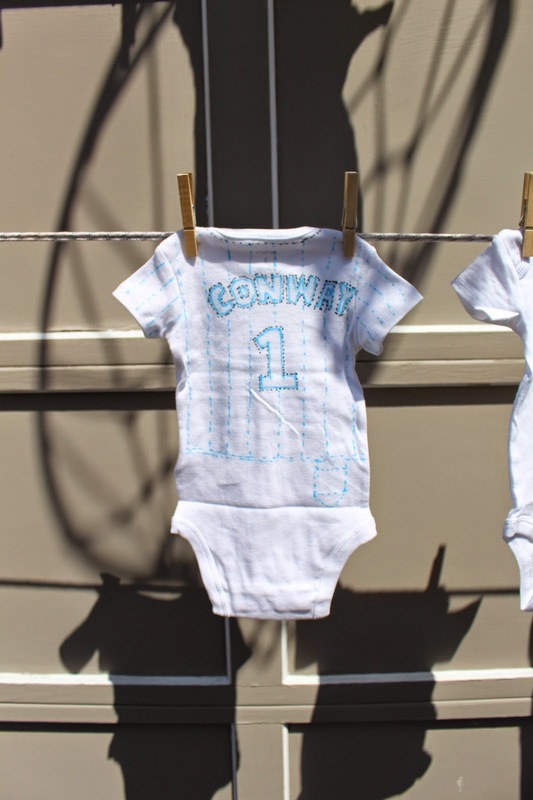 Next up - prizes for two of the onesies – the father and grandfather both got to choose their favorites. 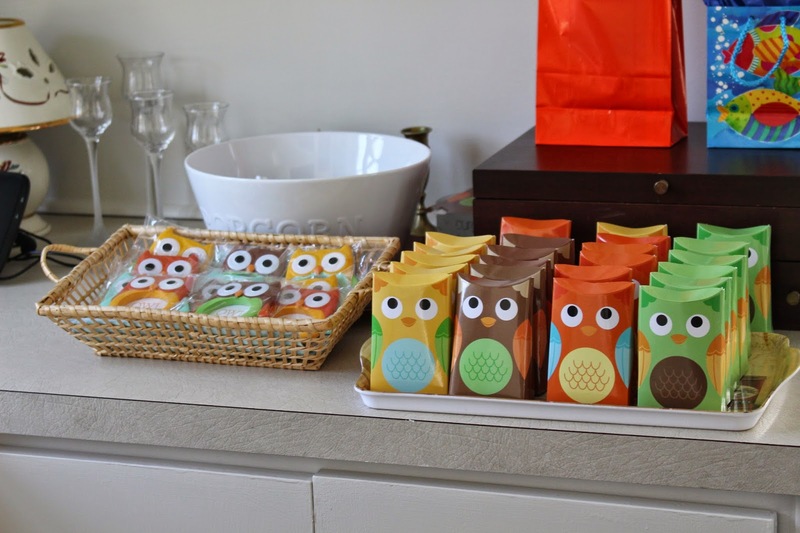 The theme for the nursery is forest and so the favors were owl themed. The other thing we did is ask people if they wanted to bring a book for Baby's First Library to bring them unwrapped. Sorry that I don't have a picture but we also had a table display of books - what a nice selection. Well, that's it. It was a great party and I think everyone enjoyed themselves. 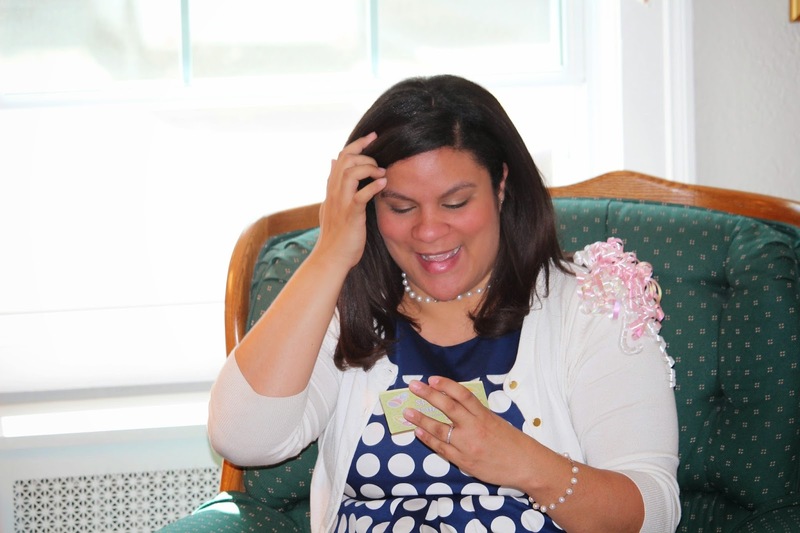 I hope you enjoyed my "Baby Shower Report." 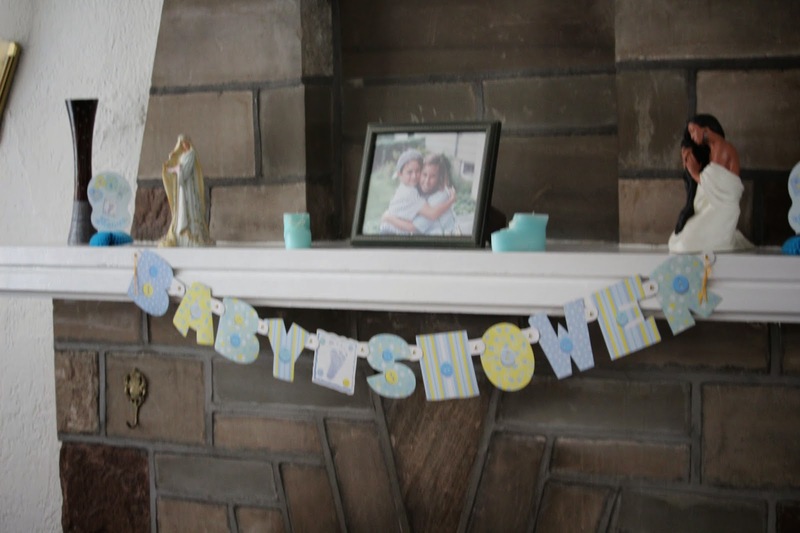 Do you have ideas for a baby shower to share? Please leave a comment and share them here. Less that 3 months to go and I'll be a grandmother for a second time. I am so looking forward to it. 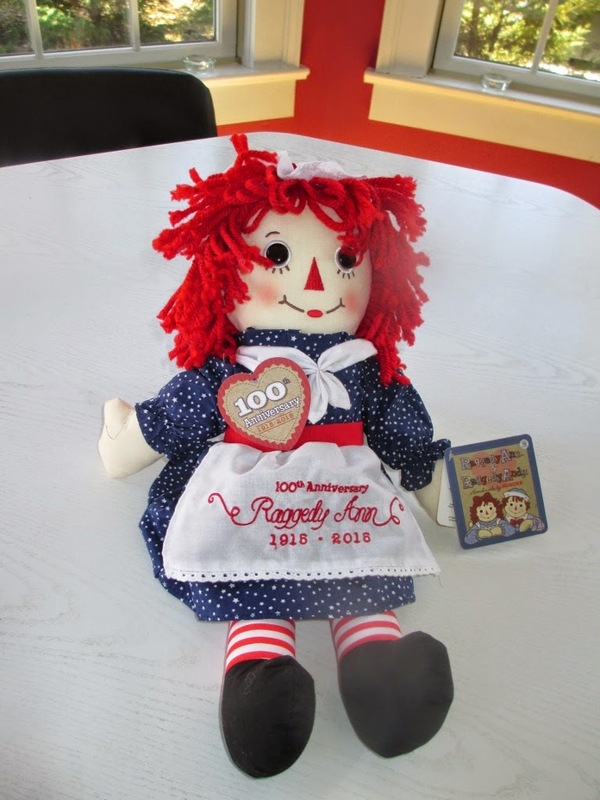 This 100th Anniversary “Stars and Stripes” Raggedy Ann doll sports “100th anniversary Raggedy Ann 1915-2015” embroidered onto her apron, a heart label and a folder with the history of Raggedy Ann. This 16 inch doll is soft and very hugable. Stars and Stripes Raggedy Andy with the 100th anniversary label on his sailor hat and the classic Raggedy Ann doll in a light blue dress. Both of these dolls also have the 100th anniversary heart hangtag and history folder. The toys I receive to review are usually given to a child. This set of Raggedy Ann and Andy dolls is a little different. First I have to say they are WONDERFUL! They capture a time gone past and and put you in a "timeless frame of mind." You smile and want to hug them. I just love them. My husband and I were looking at them on our kitchen table and he said you know these should go to someone who will really appreciate them. Yes, but I didn’t think I knew anyone who fit that bill. Fast forward less than a week and I was taking corned beef and cabbage to a 88 year old woman from our church. I walked into her home for the first time and it was covered with Raggedy Anns and Andys and memorabilia. And so, of course, Mary Louise is the proud owner of this 100th anniversary doll. 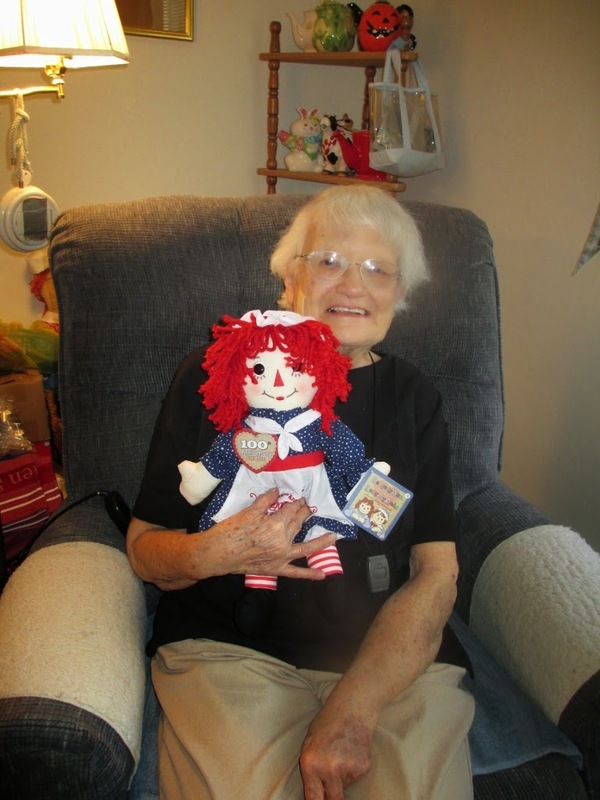 Mary Louise was so excited to receive this 100th anniversary Raggedy Ann doll and she hugged and admired her new treasure. It is now the newest member of her collection. She did lift her dress and check to see if she had a heart and indeed she does. This one is authentic. Verified by an expert. Mary Louise was also interested in the details in the history folder. 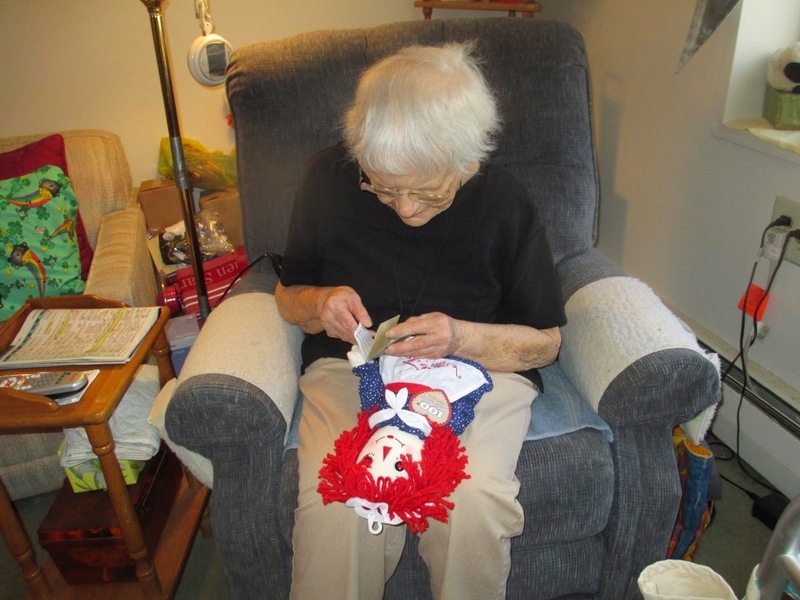 John Gruelle received a patent for the doll in 1915 and in 1918 he published the “Raggedy Ann Stories.” As the folder says, these are "heirloom treasures to be passed along for generations to come. 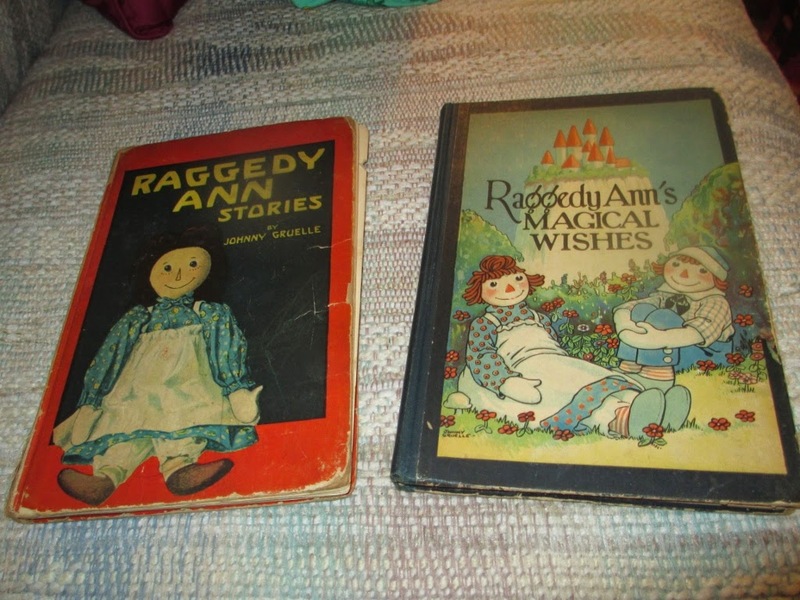 Here are two Raggedy Ann books in Mary Louise’s collection – one is the original published in 1918 and the other was published in 1928. They have been well read and are worn with love. 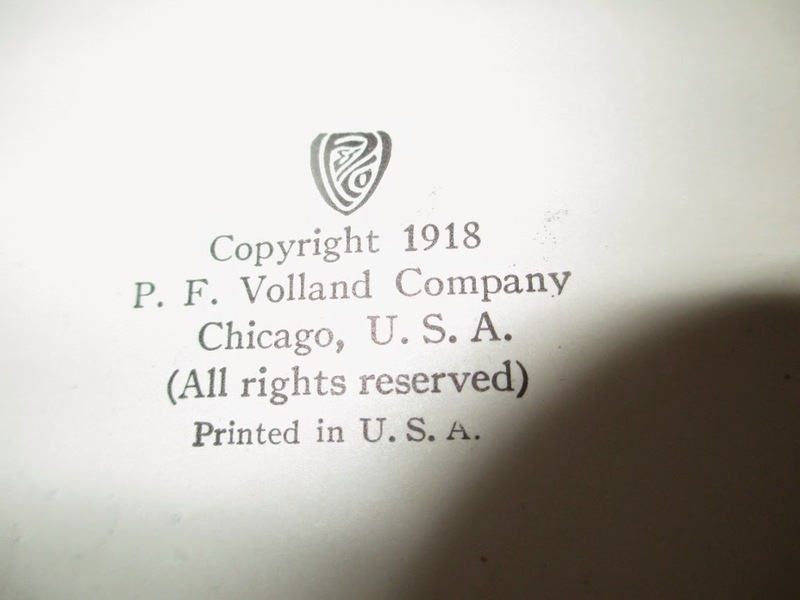 The pictures below include the publisher’s page and a page of the color illustrations of the book. You can still get the Raggedy Ann Stories at Amazon. 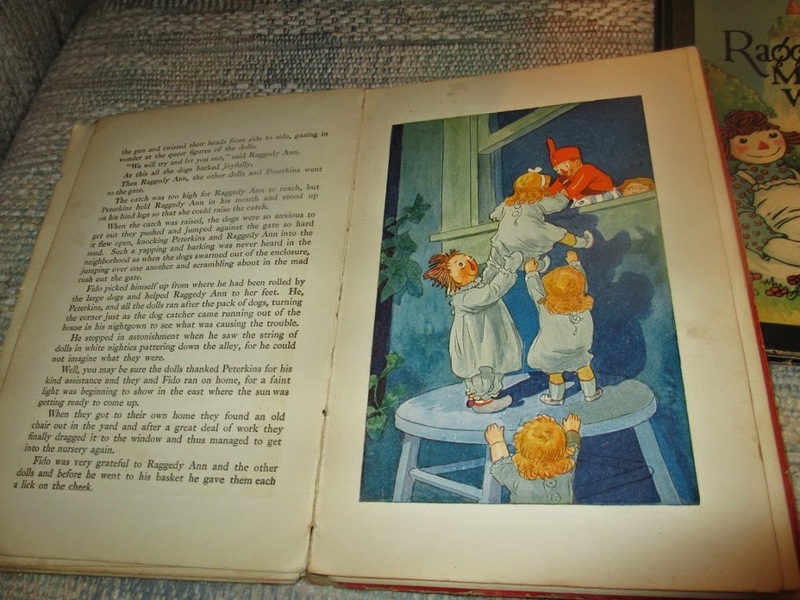 Do you believe these color illustrations in a 1918 publication of the Raggedy Ann stories? Mary Louise took out some of her other special edition Raggedy Anns kept in boxes and you can tell that she is a proud - and more important - joyful collector. 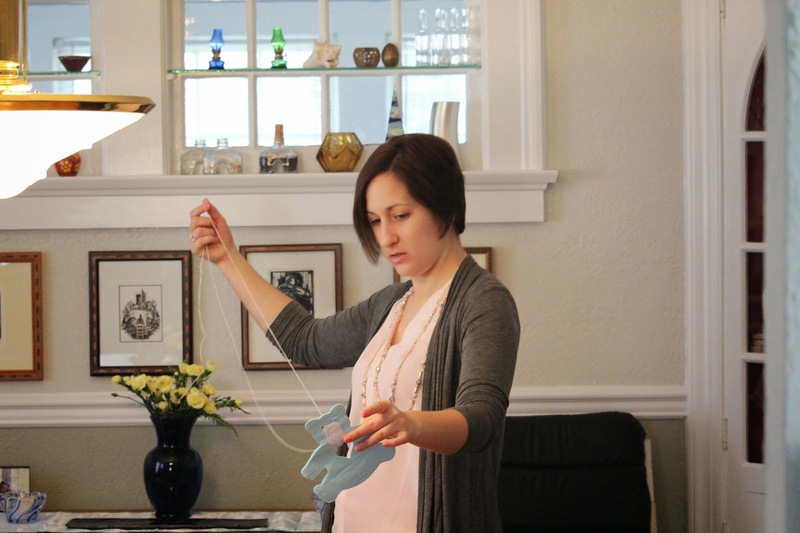 These dolls will also be loved by a young child and they certainly are the type of doll that becomes a life long best friend. I am keeping the 100th anniversary Raggedy Andy for my grandson due this summer. Reviewing these Raggedy Ann dolls became more of a wonderful experience that just a review for me. I must say that I have become a Raggedy Ann fan! And now you have an opportunity to win all three dolls and start your own collection or give one to your own favorite doll collector. Before I go to the giveaway details I have to thank Aurora Gifts for making my friend and I so very happy with these dolls. I have seldom been so happy when gifting a review item. You can have two entries by doing both. Deadline to enter: April 22, 2015 at midnight. The winner will be selected using random.org. This item can be sent to US and Canadian addresses only. Full Disclosure: This review is completely my own opinion and I was not reimbursed for it. I did receive review samples.